1.1 2018/07/31 1.Certified IaaS platforms is updated. SAP HANA is an in-memory, column-oriented, relational database management system developed and marketed by SAP. Its primary function as database server is to store and retrieve data as requested by the applications. In addition, SAP HANA performs high-performance analysis and real-time data processing to address customers’ rapidly growing requirements on business analysis. This deployment guide describes how to plan and deploy the SAP HANA system on Alibaba Cloud ECS, including how to configure the ECS instances, block storage, network, and SUSE Linux Enterprise Server (SLES) operating system. This guide includes the best practices from Alibaba Cloud and SAP. This deployment guide describes a memory-optimized instance that runs on the Intel Broadwell architecture and belongs to the ECS enterprise instance type family. The SSD cloud disk and Ultra cloud disk can be used to host data volumes and logs in the SAP HANA database. The following table lists services included in the Alibaba Cloud core components used by this deployment guide. Elastic Compute Service (ECS) is a type of computing service that features elastic processing capabilities. ECS has a simpler and more efficient management mode than that for the physical server. You can create instances, change the operating system, and add or release any number of ECS instances at any time to fit your business needs. It is applicable to I/O intensive applications, and provides stable and high random IOPS performance. It is applicable to medium I/O load application scenarios and provides the storage performance of up to 3,000 random read/write IOPS for ECS instances. The Alibaba Cloud Virtual Private Cloud (VPC) is a private network built on Alibaba Cloud. It is logically isolated from other virtual networks in Alibaba Cloud. VPC enables you to start and use Alibaba Cloud resources in your own defined network. Alibaba Cloud Object Storage Service (OSS) is a network-based data access service. OSS enables you to store and retrieve structured and unstructured data, including text files, images, audios, and videos. SAP HANA platform V1.0 and V2.0 are supported now. SAP HANA supports single-node (scale-up) and multi-node (scale-out) architectures. Note that the ECS instance for SAP HANA does not have a public IP address, which means that it cannot be accessed from an external network. Instead, a bastion host and SAP HANA Studio must be used for accessing SAP HANA during deployment. The SAP HANA Studio instance and bastion host must be deployed in the same VPC as the SAP HANA instance. You must provide a Windows host to install SAP HANA Studio, deploy the host instance in the same VPC as the SAP HANA instance, and configure the firewall policies to enable your SAP HANA Studio to connect to the SAP HANA database. The ECS instance ecs.se1.14xlarge for the master node of the SAP HANA database, including: 56 vCPUs, 480 GB memory, an SSD cloud disk whose size is greater than 1.5 TB for the data volume, and two SSD cloud disks whose sizes are greater than 512 GB for the log volume and HANA shared volume. See the storage configuration example in Step 7 of Create an SAP HANA instance``. 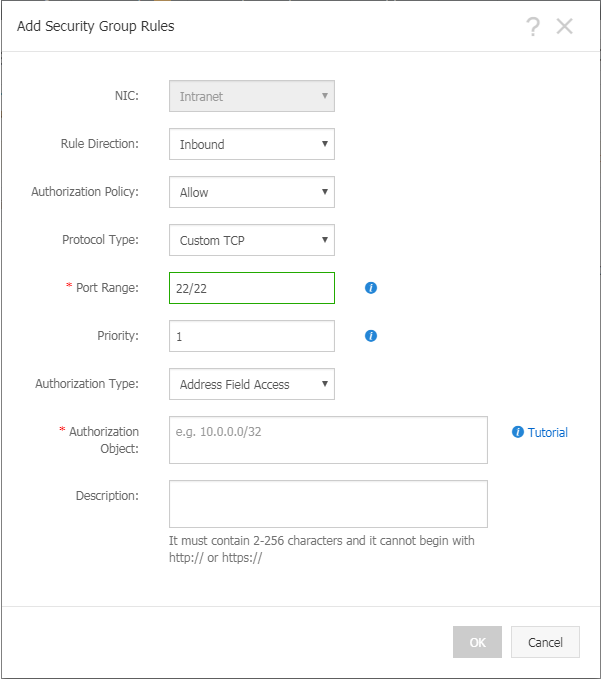 A VPC with a custom topology and an IP address range that can be allocated in your selected region. The SAP HANA database and other ECS instances are launched within this VPC. You can use an existing VPC to deploy SAP HANA. An Internet gateway configured for the public egress for your SAP HANA and other instances. This guide assumes that you are using this gateway. ECS security group, used to restrict access between instances. A 2TB ultra cloud disk for backup of the SAP HANA database. ECS VM ecs.sn2.medium running in Windows to host SAP HANA Studio. ECS VM ecs.n1.medium as a bastion host. The following figure shows the SAP HANA multi-node architecture. Systems where SAP business applications are deployed must be scaled up. As HANA is an unshared architecture, scale-out systems connect a group of small SAP HANA systems together into one cluster database. With the increased workload demand, the multi-node (scale-out) architecture can balance the load across all nodes. The scale-out architecture consists of one master node and several worker nodes. They are interconnected through a network with a capacity up to 10 Gbps. Each node has its own /hana/data and /hana/log volumes on the SSD cloud disk, providing consistent and high IOPS I/O services. The master node also serves as an NFS master node for the /hana/shared and /hana/backup volumes, which is attached to each worker node. The ECS instance ecs.se1.14xlarge for the master node of the SAP HANA database, including: 56 vCPUs, 480 GB memory, an SSD cloud disk whose size is greater than 1.5 TB for the data volume, and two SSD cloud disks whose sizes are greater than 512 GB for the log volume and HANA shared volume. See the storage configuration example in Step 7 of Create an SAP HANA instance. The ECS instance ecs.se1.14xlarge for the worker node of the SAP HANA database, including: 56 vCPUs, 480 GB memory, an SSD cloud disk whose size is greater than 1.5 TB for the data volume, and two SSD cloud disks whose sizes are greater than 512 GB for the log volume and HANA shared volume. This section describes how to deploy a multi-node SAP HANA on Alibaba Cloud. Perform the registration process. Go to the Alibaba Cloud homepage, and click Free Account on the upper-right of the page. Download SAP HANA installation media. Log on to the Alibaba Cloud website. After OSS is activated, click Console to go to the OSS console interface. Go to the OSS console interface. Click Create Bucket. The Create Bucket dialog box is displayed. In the Bucket Name text box, enter the bucket name. The bucket name must comply with the naming rules and must be unique among all existing bucket names in Alibaba Cloud OSS. The bucket name cannot be changed after being created. For more information about bucket naming, see OSS basic concepts. In the Region drop-down box, select the data center of the bucket. The region cannot be changed after being subscribed. To access the OSS through the ECS intranet, select the same region with your ECS instance. For more information, see Access domain name. In the Read/Write Permissions drop-down box, select a permission for the bucket. Public-Read-Write: Anyone (including anonymous access) can perform read and write operations on the files in the bucket. Use this permission with caution because the fees incurred by these operations will be borne by the creator of the bucket. Public Read: Only the creator of the bucket can perform write operations on the files in the bucket, while anyone (including anonymous access) can perform read operations on the files. Private: Only the creator of the bucket can perform read/write operations on the files in the bucket. Other users cannot access the files. Click Submit. The bucket is successfully created. Go to the OSS console. Click the name of the bucket to which you will upload a file to open the bucket management page. Click Object Management to open the page where all files in the bucket are managed. Click Upload File to open the “Select File” dialog box. Select the HANA installation package and click Open. After the file is uploaded, click Refresh to view the uploaded file. A zone is a physical area with independent power grids and networks in one region. The network latency for ECS instances within the same zone is shorter. Intranet communication can take place between zones in the same region, and fault isolation can be performed between zones. Whether to deploy ECS instances in the same zone depends on the requirements for disaster tolerance capabilities and network latency. If your applications require high disaster tolerance capabilities, We recommend that you deploy your ECS instances in different zones of the same region. If your applications require low network latency between instances, We recommend that you create your ECS instances in the same zone. Alibaba Cloud data centers are deployed in the following regions now: China East 1 (Hangzhou), China East 2 (Shanghai), China North 1 (Qingdao), China North 2 (Beijing), China North 3 (Zhangjiakou), China South 1 (Shenzhen), Hong Kong, US West 1 (Silicon Valley), US East 1 (Virginia), Singapore, Asia Pacific NE 1 (Japan), Germany 1 (Frankfurt), and Middle East 1 (Dubai). The data centers in China East 1 (Hangzhou), China East 2 (Shanghai), China North 1 (Qingdao), China North 2 (Beijing), China North 3 (Zhangjiakou), and China South 1 (Shenzhen) offer multi-line BGP backbone networks covering all provinces and municipalities in China and providing stable and fast access within Chinese mainland. The data center in Hong Kong offers access at international bandwidth, covering Hong Kong and Southeast Asia. As the partner of the data center in Singapore, SingTel is a dominant operator in Southeast Asia. Highly reliable in terms of business expertise and maturity, the company is well-positioned to serve users across the region. The data center in Asia Pacific SE 2 is located in Sydney, Australia. The data center in Asia Pacific NE 1 is located in Tokyo, Japan. The data center in US West 1 (Silicon Valley) is directly connected to the backbone networks of multiple American operators through BGP lines. In addition to the entire US region, the data center extends its reach to South America and Continental Europe. The data center in US East 1 is located in Virginia of the United States. The data center in Germany 1 is located in Frankfurt. The data center in Middle East 1 is located in Dubai, UAE. In general cases, we recommend that you select a data center closest to your end users to further speed up user access. Alibaba Cloud’s data centers in Chinese mainland are similar to each other in terms of infrastructure, BGP network quality, service quality, and ECS operation and configuration. Domestic BGP networks ensure fast access to regions across China. The data centers outside the Chinese mainland provide international bandwidth and target areas outside the Chinese mainland. Access to these regions from the Chinese mainland may cause high latency. Therefore, you are not advised to use them. If you have business requirements in Hong Kong or Southeast Asia, you can select Hong Kong or Singapore. If you have business requirements in Japan or South Korea, you can select Asia Pacific NE 1 (Japan). If you have business requirements in Australia, you can select Asia Pacific SE 2 (Sydney). If you have business requirements in America, you can select US West 1 (Silicon Valley) and US East 1 (Virginia). If you have business requirements in Continental Europe, you can select Germany 1 (Frankfurt). If you have business requirements in Middle East, you can select Middle East 1 (Dubai). Different Alibaba Cloud products in different regions cannot communicate with each other through an intranet. ECS, ApsaraDB for RDS, and OSS instances in different regions cannot communicate with each other through an intranet. ECS instances and other cloud resources in different regions, such as ApsaraDB for RDS and OSS instances, cannot communicate with each other through the intranet. Server Load Balancer cannot be deployed for ECS instances in different regions, that is, ECS instances bought in different regions cannot be deployed in the same Server Load Balancer instance. A single VPC can only be deployed in one region. VPCs in different regions cannot be communicate with each other by default. You can select VPCs based on the actual running environment. The SID needs to be specified during SAP HANA installation, and <sid>adm is used as the account for the HANA system (not the account for the HANA database). If this account does not exist, HANA will create one by default. When you create user accounts, do not name them with “adm” as the ending, in case HANA identifies them as the HANA system account and forcibly modifies related information. In addition, in the scale-out scenarios, all nodes must use the same <sid>adm, and uid and gid must be consistent. Alibaba Cloud will not create any account within system. The default user in Linux is only the root user. During system use, you can create or delete user accounts as required by the operating system. For example, you can use useradd and userdel to manage your accounts in Linux. In the left-side navigation pane, click “VPC”. On the VPC list page, select the region where the VPC is located, and click “Create VPC”. In the “Create a VPC” dialog box, enter the VPC name and select the network segment for the VPC. You can select one of the following standard network segments of the VPC: After the VPC is created, its network segment cannot be modified. We recommend that you use a large network segment to prevent subsequent resizing. After the VPC is created, a VPC ID is generated. A router is created for the VPC at the same time. Click Next to create a switch. On the Create a Switch tab page, provide the following information, and click Create Switch. Name: Specify the switch name. Zone: Select the zone of the switch. Network segment: Specify the network segment of the switch. The network segment of the switch can be the same as that of the VPC to which the switch belongs or the subnet of the VPC network segment. The size of the network segment of the switch must be between a 16-bit netmask and a 29-bit netmask. NOTE: If the network segment of your switch is the same as that of the VPC to which your switch belongs, you can only create one switch under the VPC. Return to the instance list page, and click the ID link of the created VPC to enter the VPC details page. Check the VPC and switch on the page. A security group is a logical group that consists of instances in the same region with the same security requirements and mutual trust. Each instance belongs to at least one security group, which must be specified at the time of creation. Instances in the same security group can communicate through the network, but instances in different security groups cannot communicate through an intranet by default. Mutual access can be authorized between two security groups. A security group is a virtual firewall that provides the stateful packet inspection (SPI) function. Security groups are used to set network access control for one or more ECSs. As an important means of security isolation, security groups are used to divide security domains on the cloud. A single security group cannot contain more than 1,000 instances. If you require intranet mutual access between more than 1,000 instances, you can allocate them to different security groups and permit mutual access through mutual authorization. Each instance can join a maximum of five security groups. Each user can have a maximum of 100 security groups. Adjusting security groups will not affect the continuity of a user’s service. Security groups are stateful. If an outbound packet is permitted, inbound packets corresponding to this connection will also be permitted. Security groups have two network types: classic network and VPC. Instances of the classic network type can join security groups on the classic networks in the same region. Instances of the VPC type can join security groups on the same VPC. Security group rules can be set to permit or forbid ECS instances associated with security groups to access a public network or an intranet from the inbound and outbound directions. You can authorize or delete security group rules at any time. Security group rules you have changed will automatically apply to ECS instances associated with the security groups.When setting security group rules, make sure security group rules are simple. If you allocate multiple security groups to an instance, up to hundreds of rules may apply to the instance. When you access the instance, the network may be disconnected. Each security group can have a maximum of 100 security group rules. In the left-side navigation pane, click Security Group. Select the region on which you want to create a security group. Click “OK” and then click “Configuration Rule”. Complete rule settings by following the corresponding instructions. We recommend that you keep only the ports for remote access. During SAP HANA deployment, a VPC is used. You only need to set the rules in the outbound and inbound directions, without specifying the public network or VPC. The security group rules are blank by default. When creating an ECS instance, make sure that the selected security group contains port 22 (Linux) or 3389 (Windows). Otherwise, you cannot remotely log on to the ECS instance. TCP 3389 Internet IP address You must access all IP addresses of HANA Studio. TCP 1 0.0.0.0/0 (all VMs) You can access any other VMs from a Windows VM. TCP 22 Internet IP address You must access all IP addresses of the bastion host. TCP 22 0.0.0.0/0 (all VMs) You can access any other VMs from a bastion host. For more information about specific ports that SAP needs to access and the related security group rules, see SAP official documentation. Log on to Alibaba Cloud ECS ECS product purchase page. Select Subscription as the billing method. Select the region and zone. Select the region as required. If you have configured a switch, select a zone. Select “VPC” for the network type. After selecting the network type, enter the information about the created or existing VPC and switch. In a multi-node architecture, SAP HANA does not provide external services directly. Therefore, set “Public IP Address” to “Not Allocate”. Select an instance type that passes SAP HANA authentication, that is, “56 vCPU 480GB (ecs.se1.14xlarge)” in the “Memory se1” instance type family of “Series III”. Select an operating system image. The operating system is SUSE Linux Enterprise Server 12 SP1 for SAP Applications. The related images can be obtained from the image marketplace. NOTE: After the instance and storage disks are created, open a ticket from the Alibaba Cloud support portal to request a special support for using an SSD cloud disk in SAP HANA deployment. Alibaba Cloud support experts will contact you to introduce more details. After setting the initial password, click “Create”, and wait several minutes for instance initialization. Create a bastion host with one vCPU and 2 GB memory and without additional storage in the same VPC of the same zone by following the preceding steps. Configure the network for the bastion host. There are multiple ways to configure a public IP address now. The elastic IP address (EIP) configuration is used as an example. An EIP is a public IP address resource that can be independently bought and held. It can be dynamically bound to or unbound from different ECS instances without stopping the ECS instances. Log on to the EIP console. On the purchase page, select the region, bandwidth peak, and billing method of the EIP, click “Buy Now”, and make the payment. NOTE: The region of the EIP must be the same as that of the ECS instance to which the EIP is to be bound. Return to the EIP list page, select the region of the EIP, and click “Refresh” to check the created EIP instance. In the “Bind a Public EIP” dialog box, select the created ECS instance, and click “OK”. After the binding is complete, click “Refresh” on the EIP list page to check the EIP instance status. When the EIP instance status is “Allocated”, the ECS instance to which the EIP is bound can be accessed through a public network. Log on to the ECS instance and run the following command to test access through a public network. Log on to an instance. No public network is configured for the HANA ECS instance currently. Therefore, a bastion host is required for logon to the HANA ECS instance. Install the SAP HANA database. Create the /hana/data, /hana/log, /hana/shared, and /hana/backup directories. Format and attach the four data disks based on the specifications and relationships of the disks applied in Step 7. Download the SAP HANA installation file in OSS to the local /hana/shared directory. A master HANA node is created in the preceding steps. Configure NFS services on the node and configure /hana/shared and /hana/backup as shared directory. Repeat steps 1 to 8 to create a worker node VM in the same VPC. Note that only /hana/data and /hana/log are required for storage of the worker node. 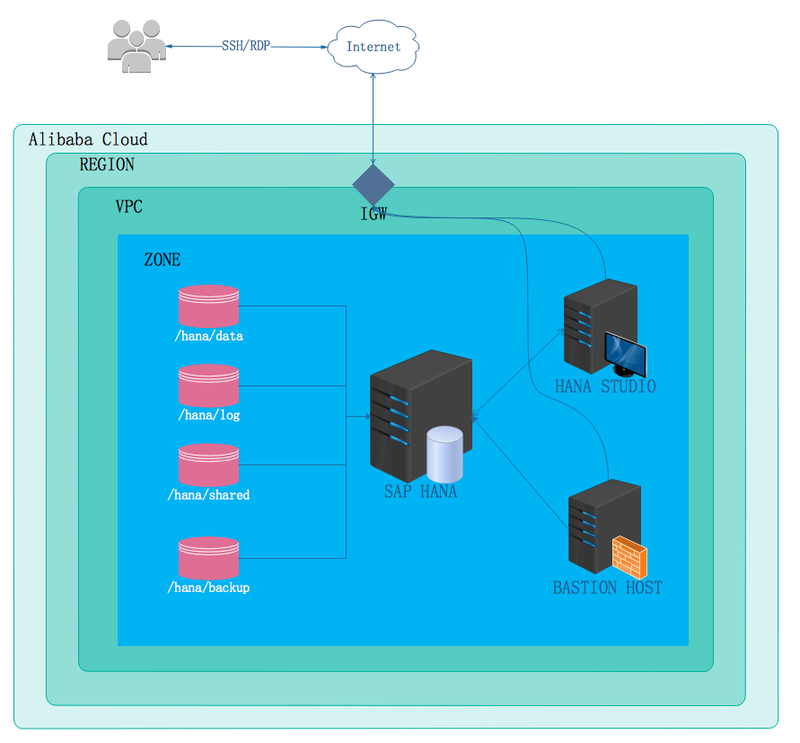 Attach the/hana/shared and /hana/backup directories on the master node to the worker node. Configure the /etc/hostsfile on all nodes to ensure that the relationship between the host name and the IP address of all nodes can be resolved. Run hdblcm on the master node to add a worker node. Extra storage space does not need to be configured. A Windows image is required. No public IP address is allocated. Repeat step 10 in the preceding process to configure a public IP address for the instance. Connect to the instance through the public IP address. Why are the bastion host and SAP HANA Studio required? No public IP address is configured for the SAP HANA instance. Therefore, a bastion host and SAP HANA Studio are required to access SAP HANA. The SAP HANA Studio instance and bastion host are deployed in the same VPC as the SAP HANA instance. Therefore, they can access each other directly. Generally, a bastion host runs in Linux and is used for SSH access, while SAP HANA Studio is deployed in Windows and is used for HANA management. A Linux instance is hard to directly access a Windows instance. Therefore, a public IP address is configured for the Windows VM so that SAP HANA Studio can be accessed through Internet. As no public IP address will be configured for your SAP HANA instance in the preceding deployment, you can only connect to the SAP HANA instances through the bastion host using SSH or through SAP HANA Studio deployed in the Windows VM. To connect to SAP HANA through the bastion host, connect the SSH client you select to the bastion host and then to the SAP HANA instance. To connect to the SAP HANA database through SAP HANA Studio, use a remote desktop client to the Windows VM instance. When the connection is established, manually install SAP HANA Studio and access your SAP HANA database. When using custom SUSE Linux Enterprise Server as the operating system for your SAP HANA instances, make sure that the Linux kernel version is at least 3.12.74-60.64.40, so as to prevent HANA performance degradation in some cases. If the kernel version is earlier than 3.12.74-60.64.40, upgrade the kernel to the minimum required version. For more information, see SAP Notes 2205917. Update your SAP HANA software to the latest version. Install other additional components, such as Application Function Libraries (AFL) or Smart Data Access (SDA). Configure and back up your new SAP HANA database. For more information, see Guide for backing up and restoring SAP HANA on Alibaba Cloud.